Which OS will win our ultimate showdown? Update: now read our full Windows 7 review. Buying a Windows OS used to be so simple. A new version appeared, most people agreed it was better than the last one and you'd get a copy for your next PC. Job done. But Windows Vista changed all that. Despite many years of availability, Vista's poor reception means that computer manufacturers are still selling new systems with XP. It's also common for laptops to be downgraded from Vista to XP, with battery life reportedly improving as a result. Deciding which operating system is best for you has become decidedly trickier, then, and the arrival of Windows 7 only complicates things further. Is the newcomer just Vista with a facelift? Or has Microsoft learned from its mistakes and delivered a product that will restore its battered reputation? Perhaps you should forget about Vista and Windows 7 altogether, opting for the mature XP instead? The choice might be easy. If you have old or extremely basic hardware, for instance, then XP will have a definite advantage: its relatively lightweight core means the operating system can theoretically run with only 64MB of RAM, so there'll be plenty of resources left over for your applications. However, if you have high-end requirements, such as using a powerful PC to run heavy-duty applications, Vista and Windows 7 come into their own. They're better optimised for multicore CPUs, and Windows 7 in particular includes a number of tweaks to make the best of the latest hardware. You may well find yourself somewhere between these two extremes, though, and so the 'best' OS to use will be a more difficult decision. But don't worry – help is at hand. We've taken a test PC and laptop, installed XP, Vista and Windows 7 on them and applied a number of testing real-life benchmarks to see which will come out on top. We're aware that speed isn't everything, though, so we've also explored the new features that each OS has introduced. To make life easy for you, we've split our findings over eight categories, with an overall verdict at the end. So which is best - Windows XP, Vista or Windows 7? Read on to find out what we've uncovered. It's often said that recent versions of Windows have become bloated, and it's hardly unreasonable to expect each new OS to perform better than its previous iteration. However, when Windows XP first appeared back in 2001, it was designed to run happily on 300MHz Pentium II CPUs with a mere 128MB of RAM. Thus, it should come as no surprise that the lightweight OS runs quickly on today's processors. Newer OSes can optimise for modern hardware and include more powerful features, but is this extra functionality really just slowing us down? To find out, we decided to test each operating system's performance on an average PC. The system is nothing particularly special by today's standards, consisting of an Intel dual-core E5200 CPU, 2GB of RAM and an ATI Radeon HD4550 graphics card. 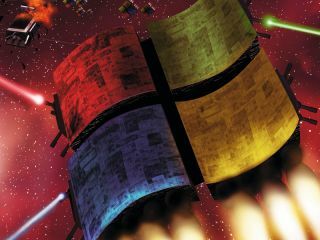 We installed XP, Vista and Windows 7 in that order (all 32-bit versions) on the machine's 500GB hard drive and ran a number of real-world benchmarks to find out which OS was best. The boot time test provided no surprises – Vista took the longest time to get started, XP came in second place and Windows 7 was the fastest. At first it seemed like our file transfer benchmarks would deliver the same results. Vista produced poor copy speeds in our small file tests, XP again placed second and Windows 7 came out on top. But when we tried transferring larger 1GB files, Vista surprisingly just managed to win out over XP. Both were beaten by the speedy Windows 7, though. This proved true for our application tests as well. Open a small Excel spreadsheet or PDF file, say, and XP beats Vista, but heavy-duty spreadsheets and PDF files opened faster under Vista than XP. Once again, however, both were trounced by the newcomer. You might have spotted the theme here. Windows 7 delivered excellent results, beating or coming close to the performance of the lightweight XP in just about every category. It's quite remarkable given that this is an operating system still in beta. When all the drivers are fully finished, we should see even better performance. If we'd run the benchmarks on a less powerful PC, perhaps one with only 1GB of RAM, then it's possible that Windows XP would have fared better than it did here. But for even a fairly basic modern PC, Windows 7 delivers the best performance around.